In a small bowl, mash up the white beans a bit. Squeeze the garlic cloves into the beans along with the oil left in the aluminum foil. Add the salt, red pepper flakes and sage if you are using it and mash to combine garlic and beans. This doesn’t have to be a smooth paste – lumps are fine. In a large skillet over medium high heat sauté prosciutto in olive oil until crisp, remove and crumble. To the same skillet, add the flat breads a few at a time and cook for about a minute on each side to lightly brown. 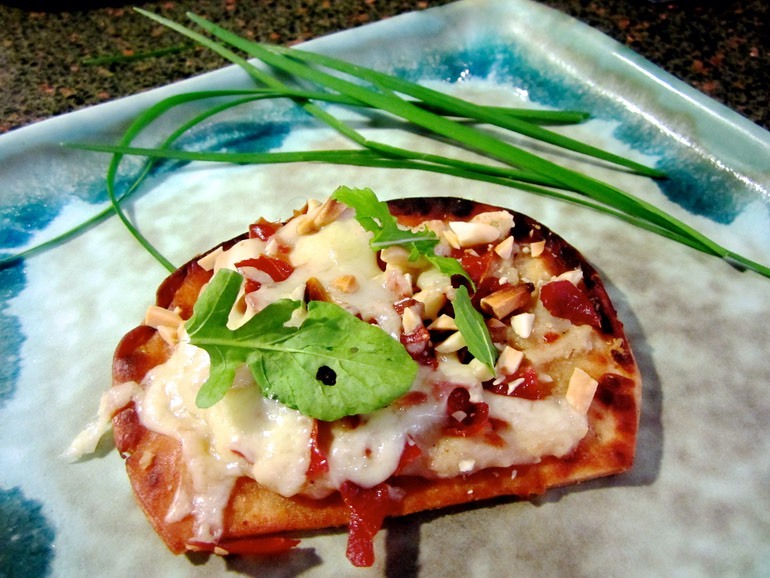 Top flat breads with bean mixture, prosciutto and divide cheese evenly over the top. Sprinkle with almonds if desired and bake for 6 to 8 minutes to melt cheese. Top with arugula and chives, or just enjoy as is!